Crashing upstream through the São Luiz rapids, the churning river throws the speedboat around like a child’s toy. There is first a moment of fear, then relief and finally wonder at crossing a natural boundary that has held back the destruction of this corner of the Amazon for almost five centuries. This is the gateway to a land that indigenous inhabitants call Mundurukania, after their tribe, the Munduruku, which has settled the middle and upper reaches of the Rio Tapajós since ancient times. The thickly vegetated shores, misty hills and untamed waters – breached at one point by a dolphin – mark it out as one of the few regions of the planet still to be explored and exploited by industrial commerce. The tranquillity is breathtaking, but misleading. These rapids are now on the frontline of one of the world’s most important struggles for indigenous rights and environmental protection. Long ignored, they are suddenly seen as a stategically crucial step between the nations with the world’s biggest farms – Brazil – and the world’s most numerous dining tables – China. Longer term, the changes now being planned could bring this waterway closer to the industrialised, traffic-filled Yangtze in more ways than one. 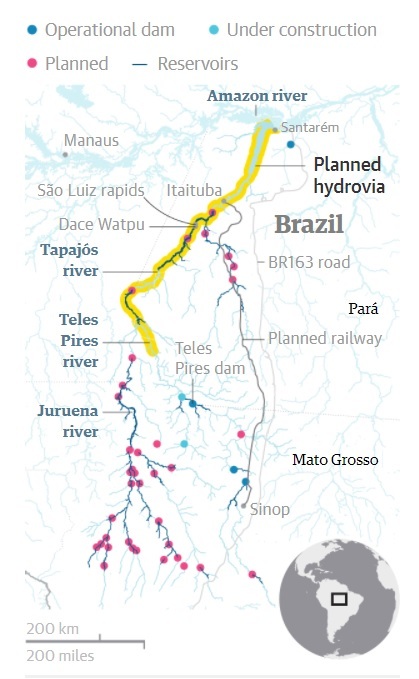 Over the coming years, the Brazilian government – backed by Chinese and European finance and engineering – wants to turn this river into the world’s biggest grain canal by building 49 major dams on the Tapajós and its tributaries. This would make the rapids navigable by barges carrying produce from the deforested cerrado savanna of Mato Grosso – which produces a third of the world’s soya – up to the giant container port being planned in the closest city of Santarém and then out to global markets, particularly in Asia. The network of dams would also produce 29gW of electricity, increasing Brazil’s current supply by 25%. A consortium headed by Furnas – a subsidiary of the state-run energy utility Electrobras – plans to sell the power to distant cities and to local mining companies that want to unearth the mineral riches under the forest. For the Brazilian government, this mega-scheme to open up the Tapajós basin – which is roughly the area of France – is a linchpin of national economic development and trade with China. For local politicians, it is an opportunity to industrialise, expand and enrich the business of nearby cities, which expect their populations to double in size over the next 10 years. For opponents, however, the “hydrovia” – as the river transport scheme is known – and related projects are the biggest threat ever posed to the native inhabitants, traditional riverine communities, waters and wildlife. By one estimate, 950,000 hectares of forest would be cleared, releasing significant amounts of carbon dioxide. “The hydrovia is part of a set of other projects – dams, ports, roads and railways – that aim to industrialise this region. Energy companies, agribusinesses and mining companies are all pushing for it,” said Fernanda Moreira, of the Indigenous Missionary Council, a Catholic NGO that works with local communities. 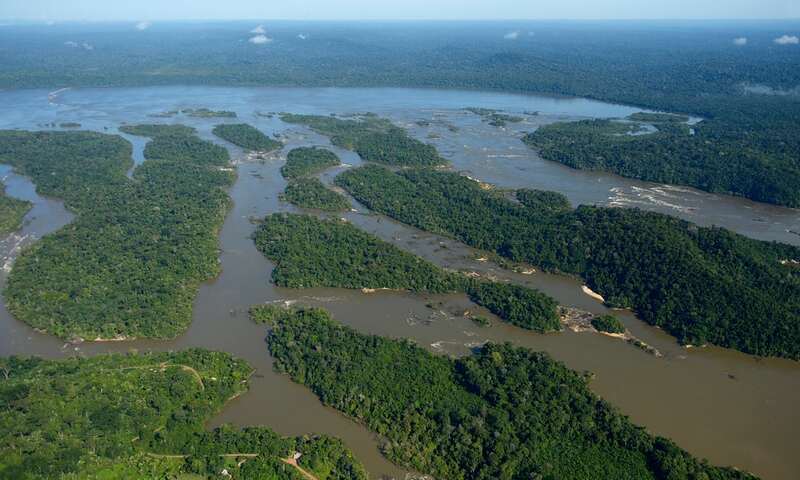 Campaigners – including International Rivers, Amazon Watch and Greenpeace – oppose the project because they say there has not been adequate study of the impacts – including accelerated deforestation, habitat loss and social problems – or the alternatives. “This is a historic moment for the Amazon. We have seen previous economic booms – rubber, logging and mining – that caused social conflict and environmental damage, but the proposed development along the Tapajós covers a much wider area and would have a much more profound impact,” said Alcilene Cardoso of the Amazon Environmental Research Institute. Opponents claimed a partial victory last year when the Brazilian environmental agency suspended a licence for the São Luiz do Tapajós dam, one of the three biggest hydroelectric plants in the project that would together flood 198,400 hectares, including large parts of national parks, nature reserves and territory claimed by indigenous groups. The battle is anything but over, however. The damming of the rapids – which would require a 7km-wide concrete barrier and a reservoir eight times the area of Manhattan – remains a priority of the powerful mines and energy ministry and Electrobras. 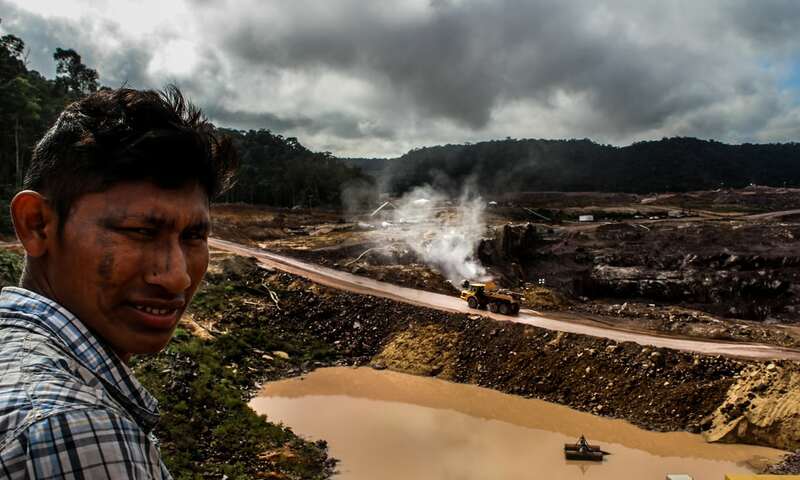 Three other dams are already under construction on the Teles Pires, a tributary of the Tapajós. Munduruku efforts to assert their territorial rights through a self-demarcation campaign have been ignored by the centre-right government of President Michel Temer and his Workers’ party predecessor, Dilma Rousseff. Half an hour above the rapids is the Munduruku village of Dace Watpu, which would be flooded if the São Luiz dam were built. Despite the suspension of the licence, they remain vigilant. “They will be back. That is our constant concern,” said village chief Juarez Saw Munduruku, as residents gathered in the small wooden hall to celebrate the fifth anniversary of the community school. As the school, the two-way radio and array of solar panels demonstrate, the villagers are not opposed to development – but they want it to be on their terms. Dams, mines and river traffic, they say, are a threat to their homes and way of life. 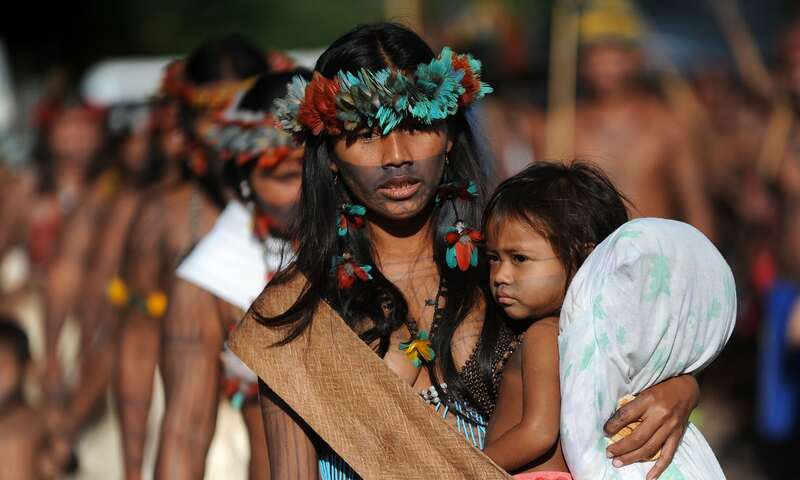 Images of Munduruku protests usually show them in traditional costume, with warpaint and feather headdresses. But their strategy is more sophisticated than these images suggest. Recognising that foreign investment and consumption are part of the issue, they have taken their campaign overseas, presenting their grievances last month at the United Nations. They have also worked with environmental NGOs, foreign media and archaeologists. The latter have verified the long history of settlement in the region, which is crucial to Munduruku ownership claims and also important to rebut the widely held idea that this region can be dammed because it is empty. The first written record of “Mundrukania” dates back to 1742, though habitation by indigenous groups goes back much further. When Bruna Rocha, of the Federal University of Western Pará, first excavated sites near the proposed dams in 2010, she found pottery, stone tools and dark earth, suggesting cultivation of the land had occurred intermittently for many centuries. “Studies of the area showed it wasn’t just an empty space that can be flooded. It has history and a culture,” she said. The image of the Amazon as a wilderness was a construct of 19th-century Europeans, which has been adopted on several occasions by Brazilian governments: first during the dictatorship era to justify a land distribution and road-building policy, and most recently by successive administrations to back up the argument that dams will not have much of a social impact. The Munduruku survived thanks to the rapids – which prevented steamships from entering their territory – and temporary alliances with European settlers against other tribes. But they are up against enormous geostrategic pressures. To lift Brazil out of recession, the government wants to ramp up exports of soya and meat, particularly to Asia. Currently China accounts for 57% of Brazil’s overseas soya sales and production and demand are expected to grow. Due to environmental pressures in China – particularly water shortages – Jaguaribe says it will become “rational” for Beijing to import more meat and grain from the farms and ranches of Mato Grosso. A Tapajós hydrovia would facilitate this. Little wonder, then, that among the construction companies aiming to provide finance and support to Furnas for dams on the Tapajós and Teles Pires is the Three Gorges Development Corporation, which built the world’s biggest hydroelectric plant on the Yangtze. French, Spanish and Italian energy firms are also involved. Thanks to a surge of development, this city – which sits on the confluence of the clear Tapajós and cloudy Amazon – is thriving. Last year, it bucked the recession that afflicted the rest of Brazil to rack up impressive growth. The world’s biggest agricultural company – Cargill of the United States – recently built a huge new grain terminal here. The municipal government is planning an even bigger container port. He has support from the Nature Conservancy, which backs plans for a dam cascade to provide energy and food to a growing global population. “The Tapajós river is important to not only its surrounding lands, wildlife and people, but also to the entire Brazilian population and to the world,” the US-based group notes. Certainly, an infrastructure upgrade is essential. The main road between Mato Grosso and Santarém – the BR163 – has recently become so choked with soya trucks that it has begun to challenge China’s worst coal transport routes for the unwelcome title of “world’s worst traffic jam”. Earlier this year, after rains turned the dirt into mud, trucks were snarled up for 10 days over a stretch of more than 50km, forcing the authorities to organise emergency provisions of food and water to trapped drivers. How to ease this bottleneck is a question of global importance. There are three approaches: an upgrade of the BR163 (which would make it wider and paved in asphalt), a parallel Ferrogrão grain railway (also financed by China and supported by many environmentalists as a lesser evil in terms of pollution and traffic), and the Tapajós hydrovia (which is preferred by grain companies, construction firms and electricity utilities). Rather than choosing one of these options, the national government is pushing all three at once. Some fear that this will lead to the industrialisation of the Amazon as forests are cleared, traffic increases, factories move in and the population surges to the point where the Tapajós begins to resemble the stressed and polluted Yangtze. Adding to these fears, the Temer government recently submitted a bill to congress that would reduce the size of the nearby Jamanxim national park by 350,000 hectares, or 40 times the area of Manhattan. The Amazon Watch NGO recently urged the government in Beijing to rethink its use of the Brazil-China Cooperation Fund to finance destructive transport projects in sensitive ecosystems. “Support of projects that result in rainforest destruction undermines China’s efforts to position itself as a leader in the global fight against climate change,” the group’s program director noted. In Itaituba, the town closest to the proposed site of the São Luiz dam, officials express similar concerns. The town – which has previously seen booms of gold mining, logging and timber – is in the midst of a new expansion due to its location as the first port below the rapids. Cargill, Bunge and four other companies have built huge terminals, which transfer grain from trucks on the BR163 to barges on the Tapajos. More are expected. On a recent afternoon, a group of Chinese businessmen – all wearing black suits and lapel pins showing the flags of the two countries – were visiting the town to look into a possible purchase of land for a port. Domestic precedents also give him cause for concern. The last huge Amazonian dam – at Belo Monte – has caused enormous social and environmental problems since it was completed in 2015. The population of nearby Altamira has surged without adequate provision of sanitation, hospitals and education. Crime, suicide rates and deforestation level are among the highest in Brazil. The project has also been a focus of a massive corruption scandal involving construction companies and politicians. Given its history as a centre of illegal mining and logging, however, Itaituba is probably not a city that environmentalists or indigenous campaigners can rely on. For now, the dire state of Brazilian public finances and local opposition are holding up plans to dam the São Luiz rapids. But in the long term, it will be hard to resist Chinese money, the politically powerful agribusiness lobby and a global economic system geared towards consumption growth. The Yangzification of the Tapajós is a distant but entirely possible prospect. The Munduruku are under no illusions, but they say they will fight to preserve the rapids that have kept them secure until now. For them, it is about conserving their home – a lesson, they say, the rest of the world should learn.